BRISTOL - When Dylan Garcia stepped out of the locker room and ran onto Alumni Field it was a moment he’ll never forget. After his first varsity start against E.O. Smith, it’s safe to say the 6-foot-1, 185-pound junior has arrived. Garcia finished with a team-high 11.5 tackles, one sack and a forced fumble against the Panthers in an eye-opening defensive performance. He flew around the field on the defensive side of the football and his hustle plays stood out on a sack of Panthers starting quarterback Jaidin Glidden and a turnover forced out of E.O. Smith’s star running back Kobe Stigler, ripping the ball out of his hands behind the line of scrimmage. The speed Garcia showed catching runners from behind was also evident, with some of those tackles earned by running Panthers players down from behind. A lot of the talk coming into the year had been his presence as a runner in the Bristol Eastern backfield, forming a 1-2 punch with Matt D’Amato. But in the opener, D’Amato got the majority of touches. Garcia ran the ball three times and finished with 11 yards on gains of 8, -2 and 5. 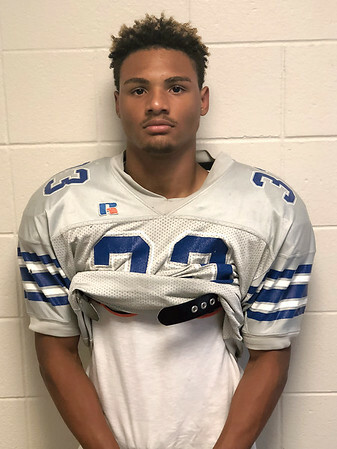 It was an impressive showing for a kid that played both wide receiver and fullback before transitioning into the tailback position at the end of his sophomore year last season. In the limited looks, Garcia showed his ability not just to burst through the line of scrimmage, but also the willingness and ability to lower his shoulder and run over opposing defenders, something the junior prides himself on. “A lot of people tell me that I have lots of speed, but my favorite thing to do is to pound the ball down the field,” Garcia said. D’Amato struggled in the backfield, with just 10 rushing yards on five more attempts than Garcia. Last season in the opener against the Panthers it was a similar story, with Ariza Kolloverja seeing limited touches before taking over as the primary runner throughout the season. Lancers head coach Anthony Julius doesn’t seem ready to unleash one of the runners like he did Kolloverja last year. “We do have to play kids on both sides of the ball and Matt and Dylan both play very physical positions on defense, so it wouldn’t be wise for us to give one kid the lion’s share of the work,” Julius said. Seeing how many chances Garcia gets in the backfield will be something to watch against Middletown, an opponent that the Lancers will need some big plays offensively in order to beat. Garcia may be the guy that gives Bristol Eastern that. Regardless of how many offensive touches Garcia gets, it’s clear that if opponents don’t yet know the No. 35 in blue and silver, they’ll find out quickly as Garcia looked to be a star in the making. Posted in The Bristol Press, Bristol Eastern on Tuesday, 11 September 2018 21:51. Updated: Tuesday, 11 September 2018 21:53.